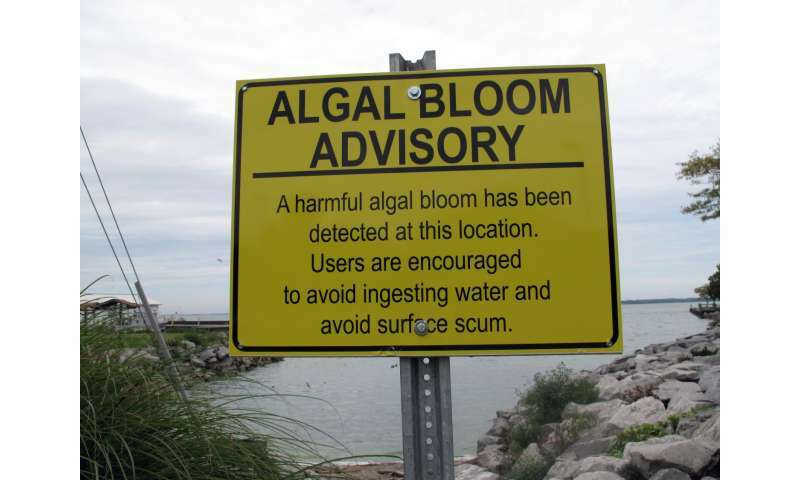 Algae advisory in Sandusky Bay in 2011. Credit: Brenda Culler, Ohio Department of Natural Resources. The researchers further simulated what would happen if a severe algal bloom—similar in extent to the one experienced in 2011 which covered 45 percent of the lake—struck Lake Erie today. In that case, the researchers projected that as many as 3,600 fewer recreational fishing licenses would be sold, and as much as $5.6 million in associated fishing expenditure would be lost in just one summer. As it turns out, people have a pretty low tolerance for algae. They devalued a lake property the moment the Ohio EPA announced that the water was unsafe to drink—the lowest warning level by WHO standards—even though the lakes included in the study were recreational and weren't used for drinking water. They began fishing elsewhere after the warning level rose to "moderate" risk for incidental ingestion of the water. In both cases, higher algae levels didn't seem to matter. Klaiber and Wolf stressed that they didn't collect any information about who owned the houses they studied—just the property values, sale or transfer prices for properties that changed hands during the study period, and the distance from those properties to the affected lakes.